Good Morning, this is Capital Essence’s Market Outlook (the technical analysis of financial markets) for Friday October 19, 2018. Stocks fell sharply on Thursday amid ongoing concerns about the U.S.-China trade war and rising interest rates. For the day, the Dow Jones Industrial Average dropped 1.27 percent to 25,379.45. The S&P fell 1.4 percent to 2,768.78. The Nasdaq Composite pulled back 2.1 percent to close at 7,485.14. The CBOE Volatility Index (VIX), widely considered the best gauge of fear in the market, surged more than 15 percent close at 20.06. Housing stocks were already under pressure as Treasury yields traded back around multiyear highs on Thursday. The benchmark 10-year note yield climbed to 3.205 percent. After surging more than 30 percent in 2017, the SPDR S&P Homebuilders ETF (XHB) fell over 2 percent on the day to 34,17, and is down nearly 23 percent YTD while the S&P is higher by 3.6%. Now the question is whether recent weakness is a pause that refreshes or it’s a beginning of something worse? Below is an update look at a trade in XHB. Our “U.S. Market Trading Map” painted XHB bars in red (sell) – see area ‘A’ in the chart. The first dominant feature on the chart is the rising trend line starting in early 2016. The second dominant feature of the chart is the downward trend since early 2018. 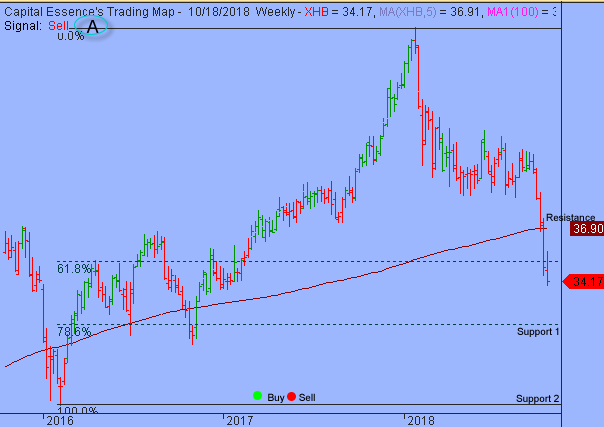 The late September selloff pushed the ETF below the 61.8% Fibonacci retracement of the 2016 upswing after falling below the 4-year moving average, a key technical level, last week. The fact that XHB had retraced more than 61.8% of its prior upswing, suggested that the entire trend will eventually retrace. XHB has minor support just below 32, based on the 78.6% Fibonacci retracement. A close below that level has measured move to 28, or the 2016 low. Short-term technical outlook shifted to slightly bearish. Last changed October 18, 2018 from bullish (see area ‘A’ in the chart). 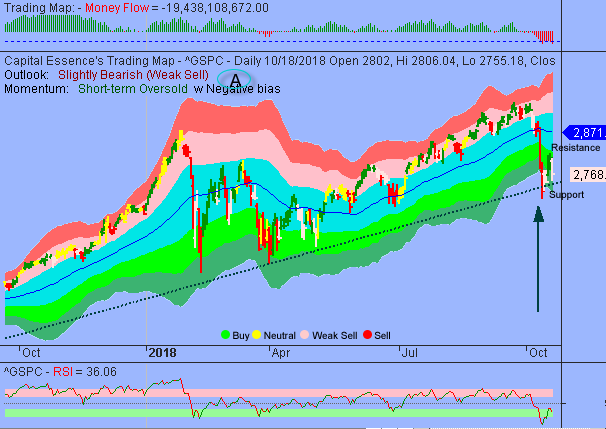 S&P moved down to test support at the 2016 rising trend line after the oversold relief bounce ran out of steam near the upper boundary of the green band. That level was significant when the index fell below it last week. It’s now acting as strong resistance. Money Flow measure hovers near multi-year low, indicating a negative net demand for stocks. Momentum indicator rolled over from near oversold zone, indicating an internal weakness. These are negative development but support is strong near the 2700 zone. This level has successfully tested last week and won’t go down without a fight. So it should not be surprising to see some backings and fillings over the next few days. In summary, the near-term technical bias remains somewhat bearish as S&P’s testing key price levels. More backings and fillings would not be a surprise. S&P’s 2700 is the line in the sand. All bets are off should the bulls fail to secure this support.